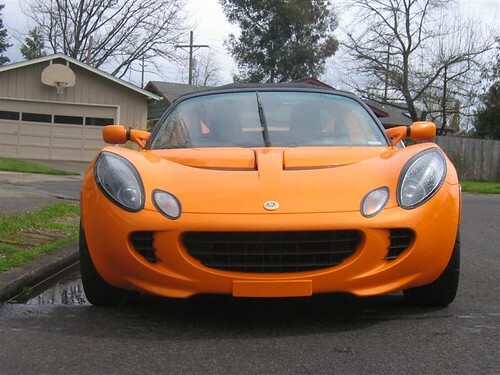 Saturday I got a most outstanding opportunity to drive the 2005 Lotus Elise pictured below. Without a doubt, the fastest, best handling, and most exclusive car I’ve ever had the pleasure of driving. For years, my benchmark for a ‘fast car’ was the Ford Mustang LX 5.0, which my roommate owned when I first started college. It was a 5 speed, and mated to that massive torque-monster V8, it was an irresponsibly fast car for kids to have access to. Burnouts through the first three gears were effortless and you could reach 100mph anytime you wanted to by hammering the gas in 3rd. At a time when I owned a $300 used Volvo, the Mustang felt like the Millennium Falcon. All these vehicles definitely diluted the mystique of the 5.0 in my mind, but certainly nothing has stood out so definitively as the Lotus has. It is strongly focused on achieving the most pure sports car experience possible. In fact, I remarked to Shana that the only car it really reminded me of that I had driven was our old 67 Midget 1275: Tiny, simple, noisy, convertible, hot, and raw are terms that would easily describe both cars. In the case of the MG, it was raw because it was made from rusty tin cans and could’ve flown apart at any time. 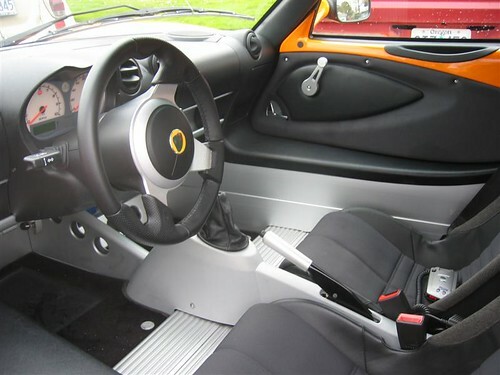 In the Lotus, it was clearly engineered by a design that followed Colin Chapman’s original philosophy: Lighter is faster. As we were finishing my drive in the Lotus, I remarked to Clayton, “This changes everything.” Nothing I have ever driven has been so quick, so sharp, so balanced… Well in my mind, this is the new benchmark for outstanding driving. Which leads to our next problem. Now that Pandora’s box of exotic cars has been opened, what other cars could possibly provide this kind of emotional response? Of course, they’re probably Italian Supercars like Ferrari’s, Lamborghini’s, and Pagani’s. And that’s the true trump card of the Lotus. While in a previous post, I made a quick summary of key features on the Lotus, I left out one important one: It’s price. The final sale price on the car I drove was likely somewhere between $50,000 and $55,000. While it’s a lot of money, certainly more than I could/should afford, it’s not out of line at all. In fact when compared to the company of cars I referred to above, that have the potential to meet it’s performance, it’s a downright bargain. Especially considering that the most affordable of the Italian supercars is the Ferrari 430 at an astounding $174,000! Yep, you could buy nearly 4 Elise’s at that price. Which begs the question, how much better could they be? Is it really four times the car? It’ll be a long time before I know the answer to that question, but for now, it’s hard to believe they could provide the same thrill-per-dollar that the Lotus delivers. This post would not be complete without a very huge Thank You to Clayton Boss for sharing this latest acquisition with me. Clayton runs a specialty car brokerage and he will soon be offering this incredible car for sale. I’ve been helping him with his website remodel and I’ve volunteered to work up a detailed account of the car for his website. Stay tuned! Up first will be a blow-by-blow of my time behind the wheel. Hey Dan, nice blog… I have to agree with you about the Elise… it’s a hot car that was created with both style and performance in mind. The designers definitely did it right. I also drive an E36 M3, and I love it. Sure, it’s no Elise, but it has rear seats and room for groceries. The Elise is outstanding, but you’re 100% right, I was not at all unhappy to get back in the M3. I can’t imagine using the Elise to pop around to the corner store for a six pack — which is fine because the Elise is for driving only. But the M3 wears so many hats so well: Comfortable, easy to get in and out of, holds 4 people with luggage, and still travels in some pretty fast company considering it’s nearly 12 years old now.